For the Horsleys, it also wasn’t planned. Dr. Heidi Horsley remembers when her mother was starting the Open to Hope Foundation. It was fantastic, but the sibling aspect was missing. 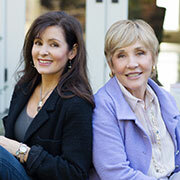 When she brought this up to her mother, Dr. Gloria Horsley, Heidi was welcomed to take on that role—but warned “Be careful what you wish for.” That was several years ago, and the two have developed a rock solid partnership that lets them both honor Scott (Heidi’s brother and Gloria’s son). Knowing each other so well, having differences, and the ability to disagree are all part of what holds a mother-daughter business partnership together. These two roles bring something very different to the table. For Rice and Wass, they’re in a similar situation. Rice’s son and Wass’ brother, Joshua, died a few years ago when he was 37 years old. He left two small children behind. In situations like these, coming together to create something meaningful can be a solid healing tool. For the Open to Hope Foundation, Gloria’s youngest daughter, Heather, takes care of website management. A true family affair, it has helped the entire family heal while keeping memories of Scott alive. Sometimes your best support (and business prospects!) is closer than you think.